I have no problem admitting that 1776 is one of my favorite musicals. I’ve seen the movie countless times and know the score inside out. 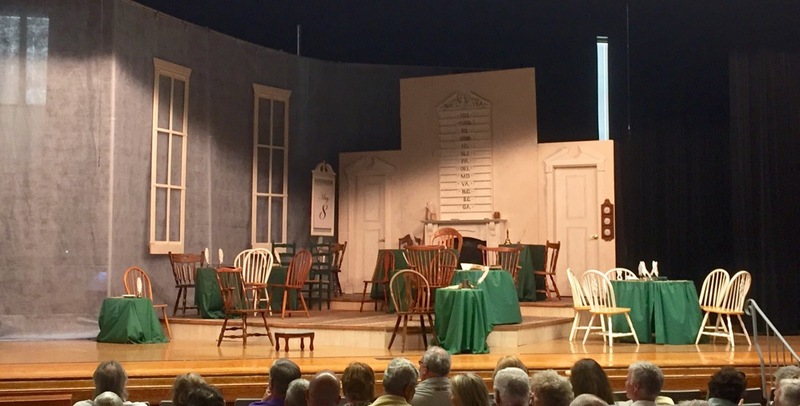 This is the first time I’ve had the pleasure of seeing a staged production though, and I was so pleased to see that Pickerington Community Theatre was handling it after their fine production of Oliver! a few months back. 1776 won the 1969 Tony Award for Best Musical, beating out the diametrically different Hair that was also a popular hit at the time. With a traditional book and score, 1776 was a throwback to a golden era on Broadway that pretty much ended with it. A film of 1776 was released in 1972 with much of the original stage cast; though initially a flop, it found its audience on video. There was also a Broadway revival that ran for nearly a year in 1998. Set in the summer of 1776, the musical tells the story of how Massachusetts congressman John Adams worked to free America from British rule by convincing the Continental Congress that independence was the only option. It took a lot of convincing to get these representatives of the thirteen original colonies to agree on anything, and the musical details the involvement of Benjamin Franklin and Thomas Jefferson in creating the Declaration of Independence as well as the opposition from the conservative land and slave owners. The music and lyrics were by Sherman Edwards, a former history teacher and pop music composer, with a book by Peter Stone, who was probably best known for writing the 1963 film Charade. This production is being performed at the Heritage Theater located at 100 North East Street between Heritage Elementary School and the Pickerington school district office. So much of the show takes place in the chamber of the Continental Congress with nearly two dozen cast members portraying representatives from the thirteen colonies, and so it makes sense to have it as a unit set always in the background when not being utilized. The set is ingeniously designed by Andrew Weibel at a 45 degree angle with several levels for the tables and chairs for the congressmen. Somehow director Adam Schroeder keeps everyone moving in such a way that it never looks overcrowded and is interesting to look at, far more appealing than if the stage was larger with everyone spaced about on the same level. The costumes (rented from Costume Holiday House) also surprised me as being quite ornate and beautifully rendered, especially Benjamin Franklin’s silver coat. Musical director Susan Laney and her orchestra deserve special commendation for their fine work. In fact, when the overture started I was a little disappointed; I thought it was a recording! The orchestra wasn’t visible because they were behind and to the left of the set, and only when I reviewed my program later did I see a list of the talented musicians responsible. The music was lively and performed at the just the right peppy tempo, so good overall that I was sure it was too proficient to be from volunteers in a community theatre production. Yes, I thought that, and now I’m eating crow. Chris Gallaugher is John Adams, unquestionably the star of the show; that is when the scene isn’t being stolen by mischievous Thor Collard as Benjamin Franklin. Chris is stern and big voiced, only faltering here and there being slightly off key. Thor is dangerous to share the stage with, every bit as good as the definitive Howard da Silva in the film version, and sometimes even better. He has a knack for highlighting several moments of subtle humor I had not noticed before and has the timing down to grab the laughs from the audience. Other standouts in this ensemble are Tim Smith as villainous John Dickinson from Pennsylvania, Thomas Durkin as crotchety Stephen Hopkins from Rhode Island, and Dave Zwiebel as sleazy Edward Rutledge from South Carolina. There are only two women in the entire show, and their stage time is precious but brief; Wendy Cohen is Abigail Adams and Marrett Laney is Martha Jefferson. Both ladies have delectable voices; Wendy’s high and firm in “Till Then” and “Yours, Yours, Yours”; Marrett’s sweet and winsome in “He Plays the Violin” (one of my two favorite songs in the show). Marrett is knowingly suggestive in just the right way that Blythe Danner just wasn’t playing the same role in the film. Few productions even of the best plays are flawless, and the few criticisms I can offer aren’t major. The Continental Congress set was nearly always fully illuminated even when scenes took place elsewhere, and it took two hours just to get to the intermission. I remember that on the commentary track for the Blu-ray of the film that the actors mentioned how on the stage they were directed to say their lines faster and faster to keep the show from running into overtime. A bit more speed, especially during the long period between “The Lees of Old Virginia” and “But Mr. Adams,” would’ve helped, as would tightening up some of the rather long scene changes. I also felt that the calendar, important for signaling the countdown to the signing of the Declaration of Independence, should’ve been placed more prominently on the set. Without any kids in the cast or special effects, I’m sure 1776 is a tough sell to those unfamiliar with its Broadway success and enduring popularity with musical theatre fans. From the outside it does seem like it would be stale and boring, a history lesson with corny music. The truth is that it’s anything but. It can’t be an easy show to stage and market, but this production succeeds on the strengths of its strong cast, beautifully rendered score, and impressive set and costumes. Did I mention that it’s also funny? Thanks for the great review of the show. We’ve been telling others about it. We hope you’re able to come back and see it again, and bring lots of friends! It was a terrific show and beautifully costumed and staged. And that orchestra sounded AMAZING!